Here's some detail on a project we did a few months ago for one of the many marketing companies that represents Lamborghini and their dealer network. We were sent a two dimensional concept rendering of the finished piece along with logo vector art, and we were off and running. The body of the thumb drives was designed in CAD, and then CNC cut from Renshape prototyping foam. Each piece was laser engraved front and back with the honeycomb logo design. Primed and painted, these pieces are 100% functional and durable enough to stand up to some tough use. The USB drives were included inside of a gift box printed and built by our friends over at Henry & Co, and the client couldn't have been more pleased with the results! This is a perfect example of something that we are perfectly suited for. In order to get this much detail in a 3D printed part, the cost would've been more than the client could bear. By using creative techniques, however, we were able to knock it out ahead of schedule and under budget. On the verge of the launch of our brand-new product for iPhone 5 and 5S, I find myself looking at some of the press we've received over the years. This is one of my favorites, so I thought we'd just share verbatim. It has a lot of detail about the Material6 product, process, reception and future plans. Enjoy! Full article here. One being that each entrepreneur can be described as innovative, however not in the 21st Century Silicon Valley regard…the first grouping of Drawing Inspiration entrepreneurs have rolled out very simplistic-functional offerings. As functional as these ideas may be, they are profound in their own right regardless of technological prowess. Secondly, each business and/or entrepreneur with a unique story to tell has surfaced from relationships in the creative world. There seems to be validity in the theory of “six degrees of separation”. Thus far, we have had the opportunity to bring forth two inspiring brands with less known stories through the power of Word of Mouth. Each of the brands that we have featured for this series are optimizing their output of Word of Mouth with an increasing focus on “Opinion Leader” marketing vs. the traditional mega-budget, multi-layer agency launch. I can certainly appreciate the value in the “Do It Yourself” spirit and the ability to organically drive what is arguably the most powerful variable in all brand building (Word of Mouth) through relationships. For this Drawing Inspiration entry we were able to host a fireside chat with Matt Turner, the co-founder of Material 6. Material 6 is a brand that manufactures hand crafted, specialized Apple product replacements. Enjoy and for more information check out Material 6. Your primary product offering is based off of enhancing the iPhone 4 and iPhone 4S…how did the idea of creating hand crafted iPhone backs come about? When I had the iPhone 3G, I spent a bit of time looking around at the case offerings out there – especially since our other product spec.dock uses Apple dock inserts. We were frequently asked about cases that were compatible with these inserts and our docks. My favorite that I came across in that research was the solid wood cases made by Miniot. I really appreciated the combination of wood, glass and aluminum, and came close to getting one if not for the added bulk. How much time did you spend in the conceptual and research/development phases before launching Material 6 as a company? Making the initial piece, which lived on my iPhone 4 for some time, was really an exercise in precision woodworking – especially with the tools we had on hand at the time. While we have a full fabrication shop, we didn’t have a few of the tools we have now to make this process much easier. We spent a good three or four months working on sourcing components and high quality wood veneers, trying out and field testing different finishes and trying to make the production aspect as efficient and repeatable as possible. We only wanted to offer the Material 6 product if it was going to hold up to the standards we’ve always held ourselves and our products to. Based on researching this fairly new industry, it seems as if Material 6 has been the first to come to market with this product. How would you describe Material 6 and what you are doing in a new market place? We were definitely first to market with this product, although competitors came on pretty quickly once the idea was released into the wild…Our concept with this product from the beginning was to emphasize the handmade, precise and high-quality nature of the product being offered. We made sure to position the product, company name, logo, website, pricing, customer service, warranty, return policy – basically anything we could think of as such. Since we have been making accessories for Apple products for over six years now, we know that they (Apple) are never content to stay with one design. Making a great product was just as important as creating a great brand, as we knew from the launch that we would need to keep up and offer new products to work with Apple’s changing handset design. What we made sure not to do was to make price a motivating factor with sales, discount codes, promotions,etc. as we also knew in advance that we were going to approach brick and mortar stores to sign on as resellers. We spend all of our time on the quality of each piece and each customer experience, and the business comes from great press and word of mouth. Currently, the Material 6 iPhone replacement backs are made of wooden inlays…Do you have any plans of expanding the product line or to use other materials? Initially, we considered other materials such as carbon fiber and possibly some metals – we had samples of brass and copper in house to work with. However, the initial thought was to use wood and we’ve really had great success with it. I have always really liked companies that do one thing and do it exceedingly well, so I wanted to stick to that formula for as long as the market remained interested in what we were offering! As I mentioned though, we’re going to have to keep it moving when the iPhone 5 comes out, so we have some plans that involve metal as a possible choice. One of the appeals to the product offering in my opinion is the actual materials and sourcing of unique wood grains from around the world. What is the process for discovering and sourcing various and exotic grains? We appreciate that you noticed! The other companies offering anything along the lines of the Material 6 replacement backs are sticking to Cherry, Walnut, Mahogany and Bamboo; while we have a huge list of woods to pull from, and we recently expanded our capabilities so we are now able to manufacture our own veneers from raw lumber. So the sky is really the limit! When we started, we were going to offer three new woods a month to limit the choices and increase the “gotta get it before it’s gone” factor, but quickly realized this wasn’t the way to go. So, we started adding three at a time periodically instead, with a max of nine at a time, and we just pick ones we like and see how they sell. In addition to the clean and aesthetically pleasing raw wood grain look, it seems that Material 6 has already launched some diverse and legendary artist editions. What is the story behind how the artist collaborations come about with guys like Benny Gold? I remember listening to Neal Boortz one day back in college telling the story of watching a skateboarder walk down the aisle in a commercial plane with his board in hand while he (Neal Boortz) thought of what a loser the skater was going to become from spending all his time on a useless “fad” pastime…I was so riled up I called in, but of course never got through. The point is though, that’s (skateboarding style & relationships) how the Benny Gold collaboration and the Cukui collaboration came to be, as well as how our website was built, all of our photos produced, and also has a lot to do with the style of the product itself. In addition to hard work, many of the connections come from the world that skateboarding has built around myself and my friends. I couldn’t help but notice Eric Koston rocking one of your replacement backs on Instagram…Beyond the list of heavy hitters in the artists series, are there any other lifestyle “celebrity” endorsers? Well, we know for sure that Koston has one, as does Paul Rodriguez (P. Rod), Justin Brock and a lot of the other Nike skate guys, but we’ve definitely had some celebrity purchases. My favorite so far was the phone call from Zach Galifianakis just because of how normal he was on the phone! That guy is hilarious…We also have had Material 6 products in the gift bags at the Billboard Awards this year. We were able to get them out to a really great list of 120 artists, so I keep checking for photos of them rocking the product. I can’t just call them up and ask, but I know they are definitely floating around in celebrity hands around the world, which is really exciting for us. Do guys like Eric Koston, P. Rod, and Zach Galifianakis have custom engraved/design Material 6 backs or are the sticking with raw wood grains? Interestingly enough, P.Rod and Zach both got blank backs and for Koston we actually did a custom high-polish piece for (that’s the only one we’ve ever done, as polished equals scratches, which is one of the reasons for replacing the glass back with wood in the first place). It seems like the engravings are kinda like tattoos – unless the engraving means a lot to the customer, they’ll typically just go with the blank piece. I’d say we engrave about 10-15% of the orders. Right now the focus is primarily on your excitement of Apple products, specifically the iPhone 4 and iPhone 4S. Do you plan to expand your product offering to other devices or manufacturers in the future? With spec.dock and with Material 6, we’ve stuck to Apple products due to their impeccable design, product cycles and market share, but we’re definitely open to other devices. It seems like a new Android handset comes out every week, but we would definitely consider expanding the line as we grow. What are the differentiating factors that set Material 6 apart from similar product offerings and/or brands? My business partner and I truly are craftsmen, who have been fabricating and woodworking for our entire lives, so to me that’s really the difference. I feel that it shows in our attention to detail and the quality of our offerings, but also in our customer service, since we want every customer to be as proud of what they’ve bought as we are of what we made. Seriously – I’ve sent more than one customer a full replacement for their order along with a return label simply because they wanted a different grain pattern than what they received. We’re that serious. As I mentioned before, we’ve been building a brand that has far-reaching plans and goals, so really hope to be a company that our customers can rely on to support the current product and products to come for years down the road. What would you like for Material 6 to accomplish in the future? Kinda answered mysteriously above, but let me know if these answers spark any other questions…it’s not that often that I get to go on a rant about what we’ve done over here, so I appreciate the opportunity! Another GTI, Another iPad Mini! 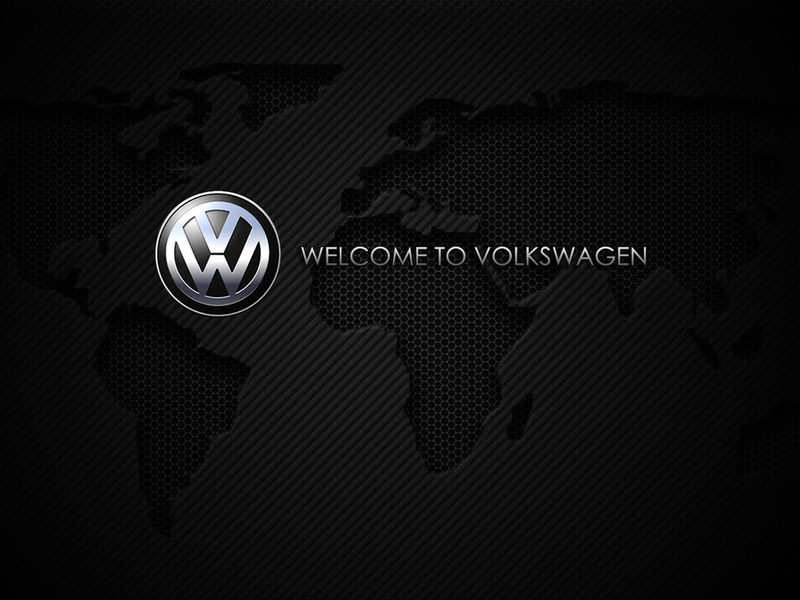 This was a pretty quick project inspired by the recent iPad Mini install in our 2011 MK6 GTI. A friend of the company saw the GTiPad Mini installation last week and just had to have one for himself! We're no strangers to the MK4 GTI here at 2point5, having done both a Mac Mini and an Apple TV in our own company vehicle a few years ago, but how times have changed - instead of having to piece together multiple complex components to integrate these devices into a car environment, the iPad Mini is a self-contained powerhouse, requiring only a few tricks of the trade to tie into the existing system for a "should have come from the factory" end result. The dash trim was made from a piece of 1/4" aluminum routed, sanded and polished to perfection like we've done before, and all that was really necessary from a mounting perspective was removing a good amount of plastic from the factory radio support to allow the iPad to be mounted from behind, with the trim panel mounted from the front. Electronically, we had to add a small amplifier to run all the speakers, and we used the same trick as we did on the GTiPad Mini project to trigger the hidden home button with a Satechi Bluetooth remote. The button for activating the remote is a factory traction control switch modified with a laser-cut and engraved home button icon that illuminates just like the factory switch does. Of course charging is handled by connecting a modified USB charger to the Lightning port on the iPad so that it stays topped off. One thing we learned from the last project was that the ideal candidate for such a project is an iPad Mini with LTE - while tethering works great for internet connectivity, the LTE iPad models also have a dedicated GPS chip for more accurate navigation. That said, one of my favorite parts of this finished product is that the main user interface is the Drive Assist app for iPad by Eugene Shvedov. This elegant front-end gives you heads-up speed, navigation, iTunes control, compass and much more in a really attractive package. The car itself is certainly no slouch either! Starting life as a 20th Anniversary GTI, the owner added genuine Votex R bumpers and sideskirts, HID lights, 19" BBS 2-piece wheels, coilover suspension, a full APR stage 4 turbo setup, a sueded headliner and a lot more. As always, we hope you enjoy our periodic forays into the car integration world, and you can count on there always being more just around the corner! 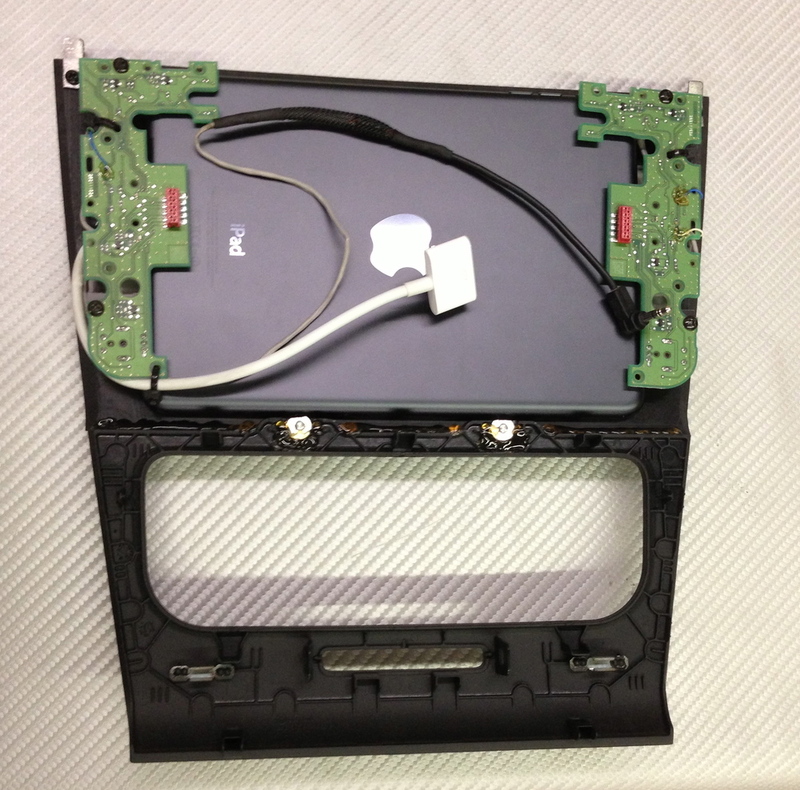 In the last post on the GTI iPad Mini project, we went into some detail on the head unit disassembly and circuit board work we did to make the iPad work in concert with the OEM radio to provide the ideal user experience. At the end of that step, all that was left to do was to fabricate a trim panel that would allow us to mount the iPad Mini, the original radio's rotary knobs and the newly fabricated switches in the dash of our GTI. This is really the most fun part, and involves a good amount of engineering as well as design. Keeping in mind that we were trying to make this look as much like a factory installed unit as possible, there were definitely some constraints to work within that made this step challenging as well! Let's get to it: The first thing to do was basically to measure out the factory radio opening, the iPad Mini's true screen size precisely to the edge of the bezel, and to position the openings for the rotary knobs. Rather than waste a lot of expensive material in the fine-tuning process, we used our in-house laser cutter to make basic templates out of cardboard until everything was just right. Here we have the basic shape of the panel that we will be making to complete the project. Note the close confines! The rotary knobs almost look like they're not going to work in the desired location, but the posts that the knobs press on to allow (just barely) for this tight tolerance. Using the laser cutter has allowed us over the past few years to design and fabricate pieces that not only are infinitely more precise than ever before possible, but also pieces that were nearly impossible to make using the tools that we were previously familiar with. For example, you can't cut a square inside corner with a router. It's simply not doable. The closest you can get is a 1/8" radius corner, which can then be filed out to be square. You'll see in the following photos just how small and detailed the pieces that the laser cutter can make are, and the amount of detail we can add to a project using this new tool in our toolbox. 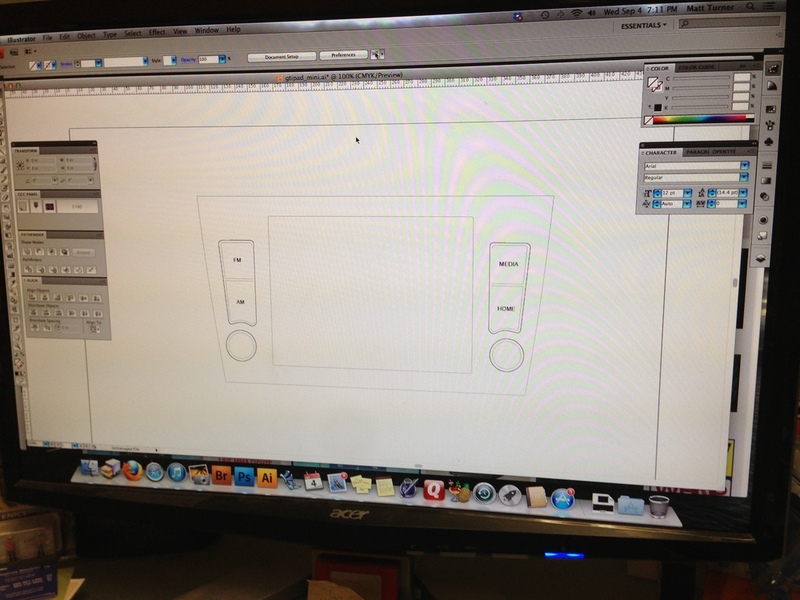 The design of the dash panel was done in Adobe Illustrator, which was then exported to the cutter. This doesn't mean that there's not a ton of hand-fabrication involved as well! The laser can only cut in two dimensions, so there was a lot to do after the fact with our typical tools - routers, sandpaper, primer, paint and the like. Afte a bit more design tweaking, test fitting and test cutting, we made a final cardboard template before moving on to cutting the base trim panel out of 1/4" clear acrylic. The idea with the rings around the new function buttons for FM, AM, MEDIA and HOME was to make the new trim piece fit into the design aesthetic of the car's original radio, where all the control buttons are trimmed with thin silver rings. We kinda jumped ahead a bit with this next photo...unfortunately we were so excited about how the piece was turning out that we didn't take photos of the piece as it came out of the laser cutter, or of the router steps that followed to add the dimension to the piece that you see here. Essentially, we first used the laser cutter to "engrave" a 1/8" deep channel around the control switch locations so that our silver detail rings would fit into these areas and be flush with the finished surface and buttons. Next, the laser cut the insides of the button holes, the opening for the iPad Mini screen, the rotary knobs and the outer shape. We then went in by hand with a second jig adhered to the first with double-sided tape to cut a 45 degree chamfer all the way to the edge of the opening for the iPad's screen. We also added a 1/4" round over all the way to the edge of the bottom of the panel using the same technique. The factory radio has a similar rounded edge at the bottom that we wanted to keep in the design for an OEM look. Next, the piece was flipped over and 45 degree chamfers were added to the back of the top edges and sides to allow the new trim piece to press into the dashboard. These cuts can be seen in some of the following photos. Lastly, the entire piece was hand-sanded from 80 grit up to 600 grit to smooth out any machining scratches and painted with SEM Color Coat Landau Black spray dye. This is by far the absolute best paint we've found to match the OEM color and texture of most car interior trim. The 1/8" thin trim rings for the buttons were also cut with the laser, which were sanded in the same fashion and finished with SEM Color Coat Silver spray dye. It's amazing how much like metal this paint makes a simple piece of cut acrylic look. We used this technique for many of the trim pieces in the Chrysler 300M project from a few years back as well. 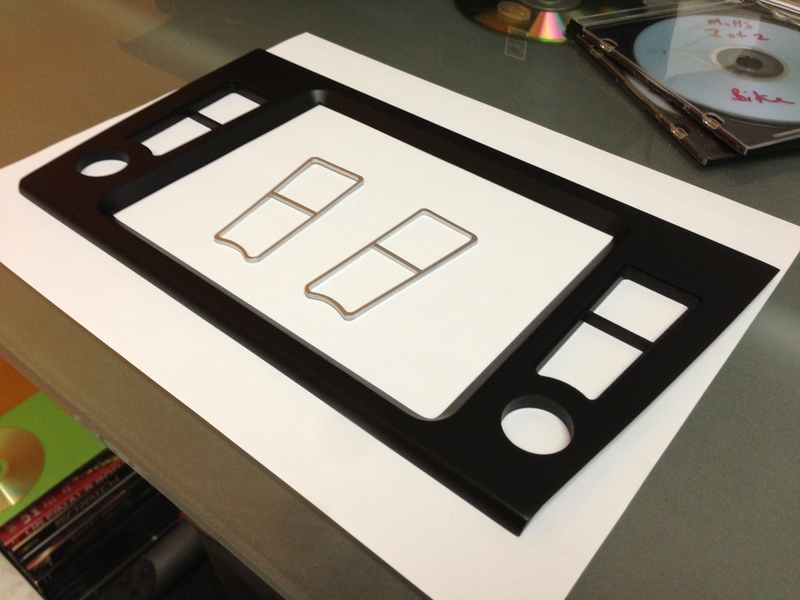 Here's a nice shot of the dash trim piece before fabricating the buttons and attaching all of the components. The four function buttons we planned to add turned out the be pretty tricky. We used a piece of 1/4" acrylic as the backing material, and a piece of 1/8" flexible sign material (the same stuff they use to make name tags for fast food restaurants) as the actual button itself. The concept is that the surface material flexes enough in a given area to press on the embedded microswitch we wired up in step 2 of this project. It took a bit of tinkering, test cutting and design changes to make this work as expected, but here's the final design. The inside surface of all four buttons can be pressed to activate the function, while the outside surface is fixed. The small hole cut in the backer material is for the microswitch to mount in securely. The beauty of this design as well is that the engraved text on the button face will light up as the original led is directly behind the clear backer material. All of the OEM radio buttons' text lights up, so we wanted to make sure that the new buttons did as well. Material was cut for all four buttons, which were then assembled and mounted to the dash trim piece using cyanoacrylate adhesive. Getting the iPad Mini mounted was pretty straightforward - a few pieces of 3M bodyside molding tape around the perimeter of the trim opening and some felt trim tape, and that part was done. We mounted the iPad in this way to allow it to be removed down the road if we ever decide to use it as a standalone iPad again. No point in ruining it with brackets and screws when this mounting method works so perfectly. Mounting the circuit boards for the rotary knobs, switches and lightning turned out to be a bit more difficult, but was accomplished in the end with 1/4 acrylic standoffs which were then drilled and tapped to accept screws that go through the original circuit boards in their original mounting locations. This was done so that they can also be removed if need be and placed back into the factory radio. Some serious epoxy would have worked here, but screws are always more precise and repeatable! You can also see some small metal tabs at the top of the trim piece in this photo - these are used to hook underneath the AC vent trim to keep the top of the new trim piece sitting flush in the dash. These were fabricated from 1/16 steel plate, which was drilled and tapped so that it could be screwed onto the acrylic trim panel. To mount the bottom of the new trim piece, we simply attached the factory AC control trim bezel to the iPad Mini trim piece with screws that were again drilled and tapped into the acrylic panel. This allows the entire piece to be plugged into the ribbon cables we left connected to the factory radio and then simply snapped in place using the clips that were installed on the AC control trim by Volkswagen. We wanted to make sure that installing and removing the new piece was as easy as installing and removing the factory radio for future service needs. This is one of those steps that is really important to keeping the functionality of the vehicle intact, and takes some engineering to work out. We could always have glued the piece in place, but that would be a real nightmare if it ever needed to be removed for vehicle service or upgrades down the road. At this point, we also installed the Apple Lightning to 30-pin converter that allow the iPad Mini to connect to the car's charging and auxiliary input circuits, and added a two-pin connector to the wiring for the Sitachi Bluetooth remote that handles the home button function mentioned in the previous post. We now had a truly plug and play single piece that was easily installed and removed from the vehicle in a matter of minutes. I really like that it all came out completely self contained. ...And there it is! Done. We ended up making a cool custom wallpaper for the lock screen that matches the OEM radio startup screen that is included below - please feel free to download and use however you'd like. In using the iPad Mini for a while in the car now, we definitely recommend a music app called Track 8 that simplifies browsing and touchscreen control in the car environment. The Apple music app is not designed with large enough control surfaces to make it safe for browsing while driving! Track 8 lets you use large swipe commands for most music controls, which is really nice when you don't want to be focusing on the screen at 70 mph. There's not too much more to say besides we're really pleased that this project turned out pretty much exactly how we intended! This is always a combination of tools, luck, skill, planning and execution, so it's always a happy moment when it's done and actually works as planned. It's really a pleasure to have such an easy interface for browsing through thousands of songs in the car that looks like it came from the factory. We've done a little browsing, a little YouTube, some navigating, etc, but the primary reason for the upgrade was music, and this beats Volkswagen's solution (even with the included on-screen iPod interface) hands-down.